Pole Vault: Is it possible to have the vaulter go over an actual wall or castle battlement? Maybe they have a teammate who catches them on the other side? How about also letting them go for distance too? Like maybe they’ve gotta shoot themselves across a river? Think about it. Discus: Haven’t we invented about 3,000 different materials that fly farther than wood and metal? Why not let those guys give it a crack with an Aerobie? Also let’s put the event on the beach and make the thrower have to find his keys in the sand before his frisbee hits the ground. Steeplechase: This is a distance race that is so long that they have put a giant hurdle and water pit on the track to keep it interesting. Since everybody runs through that waterhazard anyway, make the water deeper and stinkier, and put alligators in it… to keep everybody honest. Equestrian: He does all the work but doesn’t get to stand on the white box at the end? How is the horse not the one that gets the medal? Put the horse on the podium too. And allow him to wear a golden, unicorn type-hat to impress the fillies. Tug Of War: Bring it back, but have the coed tug-teams formed by selecting 1 athlete from each country’s different disciplines. You could have mountain bikers, gymnasts, swimmers, and a horse all teamed up to drag somebody through a mud pit! Hammer Throw: How about throwing an actual hammer? If not, change the name. It’s confusing for everybody. Shot put: Nothing is getting “Shot” or “Put” anywhere. More people might watch this if it was called “Cannon Ball Throw”. Wresting: Allow a chair or folding table to be used once per event. 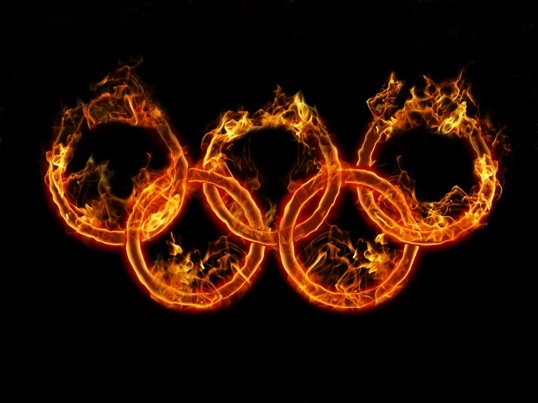 The Olympics are too important a cultural event to let slide into mediocrity. Instituting even one of these ideas could help some events not only “get over the mid-week hump”, they could make the ones that feel like the Mayflower Dog Show seem a little bit more like “Wipeout”. If you have any ideas for spicing up an Olympic event, I want to hear them. Especially if they involve fire, lasers, or tigers. Possibly all three. Feel free to post below. P.S. How is Ping Pong an Olympic Sport but Golf isn’t? Loosing a shark in the pool would make all of the water events more exciting. Smaller sharks for the qualifying rounds, big bad dudes for the medal rounds. I would actually watch water polo and the world records in the swimming events would get smashed. Oh man, I think that I might even set a world record if there was a shark in the water with me! If we learned anything from Batman, it’s that the fear of death can help you achieve your goals. I also agree with your “equestrian comments’ why don’t the horses get medals? Great read. It could be cool to have countries send a robot that they designed for competition!